'The School at Athens' is a masterpiece, well known for showing excellent composition and depth. The diagonals used in the repeating floor and ceiling tiles brilliantly pull the viewer’s eyes from the corners, easily leading towards the center vanishing point. According to the coloured fabrics, one can sense the power of each individual. For example, Plato, who is placed as the center of attention, is draped in the powerful and influential colour of red. 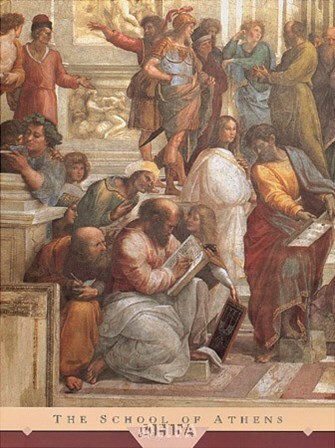 Excellent composition is again shown by the equal space between the two central figures, Plato and Aristotle, which gives the painting a powerful balance. Throughout history people have been fascinated with the identification of the individuals depicted and what they may symbolize. Those that have been positively identified using historical evidence are: Plato, Aristotle, Socrates, Pythagorus, Euclid, Alcibiades, Diogenes, Ptolemy, Zoroaster and Raphael. All are interacting in several groups, creating a natural environment. The lighting comes from many different windows, and gives a message of intellectualness by the brightness in the room. Interestingly, the warm light is focused more on the people in the back, while shadow is slightly cast upon the figures towards the front. Again, the subtleness of this technique serves to pull the viewer deeper into the facinating masterwork.